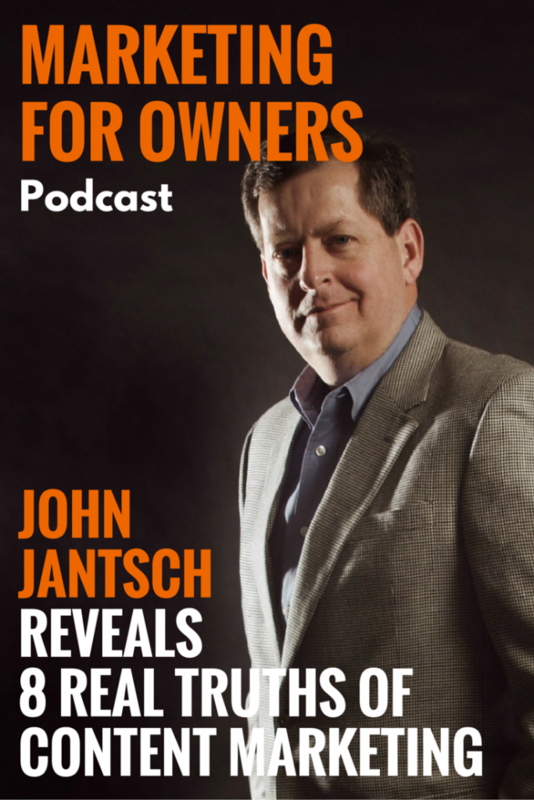 Recently I had the opportunity to talk to John Jantsch, owner of Duct Tape Marketing for our new Podcast interview series. We discussed Content Marketing and how it applies to you as a business owner. John had great information to share, in which he calls it the real truth of content marketing. John Jantsch has been in the marketing industry for longer than most. And, with being online for about 10 years, he has learned the many lessons of what content marketing is, and what it isn’t. These tips will help you decide what you need to let go of this year, and will also help you decide what you need to hone for 2016. You will get a full transcription of John Jantsch’s interview with every link and detail listed. Look at John’s list below and study it carefully. These are taken from the interview. Are there some things you might need to review and change? Or are you already doing these steps and are just looking for ways to improve them? Many businesses today don’t understand the full concept of what it means to get a customer. They love being a business owner, they love the job that they do, but when it comes to marketing — they haven’t got a clue as to what to do. Marketing to your customers should not be a foreign concept at all. The whole concept of marketing to a customer is not to make a one-time sale. The object is to make them a long-term customer and you need to know how to do that. This is why systems like the Duct Tape Marketing System and the Marketing for Owners system work so well. They both help you learn how to do just that. You don’t start out trying to make money right away — I mean, that is the whole goal in the long run, but to begin with — build a relationship with your customer. Offer them freebies, communicate with them weekly, build trust and a relationship — which in turn is marketing — and in the end, the sales will come. Constantly being stressed out in your daily work activities not only takes a toll on your personal life, but it also wreaks havoc on your business as well. One of the worst things you can do as a small business owner is to try to be everywhere and be everything to everyone in your business. You need to understand right here and right now that you cannot do everything. Delegating tasks to others will lighten your work load as an owner. One of the main ideas that I and many others like me are trying to teach is that you want to get your business to the point that you do not have to be there every minute of every day. How do you think I can spend half a year in Canada and the other half in the UK? It is because I use these practices to build my businesses so that they run efficiently without me always having to be present. This has afforded me great peace of mind and has taken a load off of my stress levels. As a business owner, one of the best things you can do for your small business is to use every available tool offered to you. The Internet and all the tools available — social media, list building, lead generation, videos, training tools, webinars, etc — all of those when used correctly will help your business grow by leaps and bounds. In fact, using those tools to your advantage can help you grow just as much as driving across town to hold a conference with a teaching seminar. But beware — because it can also lead to your business being blasted all throughout social media for you not living up to what you promised — so make sure that if you promise a product or a service — you deliver on it. One of the worst things you can do in your business is to be unrealistic. Back many years ago, if you were a business owner, you could sit with a potential customer, talk about what you could do for them, and then they decide whether or not they want to buy from you. But today, when you chat with a potential customer, there are 73 different places they can visit to decide if they even want to pick up the phone and call you. Be authentic with your clients and customers. Just be real and trustworthy. So your best bet right from the beginning is to be authentic. Share great content with your readers that shows you are the real deal. Don’t try to sound like all the other business owners out there. Use the knowledge that you have been gifted with, the experiences that you have been through to teach your customers something new. If you have a passion for something, but only give it half a try, then you are only going to get half of the results. BUT — if you give it your all, right from the beginning you can truly build your business to be everything you want it to be and more. If you are willing to realize that it is a long-term educational job, then I think it will make it easier for building your business. As an owner, you yourself need to always be learning something new. When you learn something new, then you, in turn, can teach your customer, therefore giving them another avenue to use your services or buy from you. 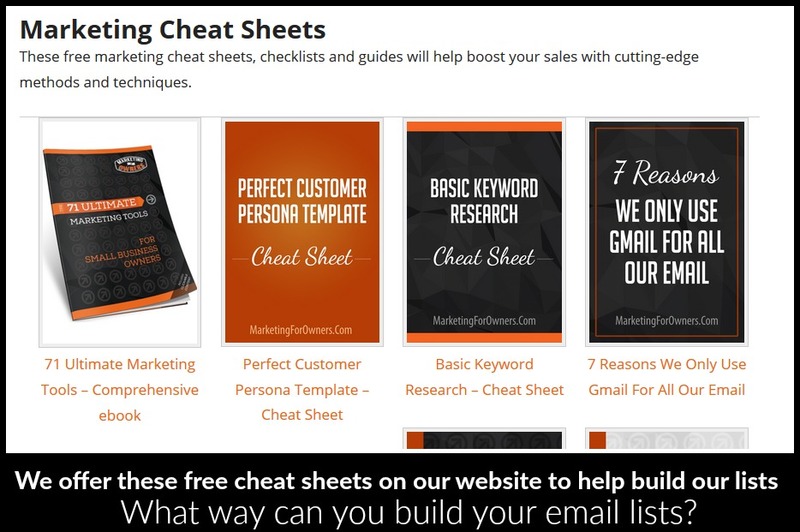 One of the things that the big marketers like John Jantsch and so many others do is that they never stop list building. While all of these things are teaching his readers and potential clients something, the main goal of these is to build his lists. And that should be your main goal to start off with right now as well. In fact, list building never ends. When you look at yourself in the mirror, do you see yourself as a tiny little small business owner, or do you see yourself as someone who is an expert in your field — someone who knows what he or she is talking about? John says that the difference between the two is that a small business owner looks at everything that has to be done and says how do I get all this done, and an entrepreneur looks at everything that has to be done and says how do I get somebody else to do all this? One of the best things that you can do for your business is to find people on your staff or even outsource all those projects that are weighing you down. As your business grows, those tasks and projects will grow too. An owner, with a small business mindset, will look at those and try to tackle them all himself. However, an entrepreneur will look at them and start delegating to those around him who were built to handle those projects and tasks. When you first start out, you may only have 2, or 5, or 10 customers. My advice to you is to treat those few just as you would if you have hundreds. You might think that at this point you are only banging your head against a wall and the numbers are not increasing, but if you stay consistent and never give up, your business will eventually take off. The same goes for the content on your website. Keep writing, keep plugging away at it and while you may only have 1 or 2 readers this week, you could have a post that goes viral and gain thousands the next week. The trick is to never give up. Finally, if you would like to check out the Duct Tape Marketing System and the marketing process that John and his team has developed, visit here. Be sure to tune in next week as I have another exciting interview for you. I will be talking with the lovely Kate Erickson from EOFire.com.